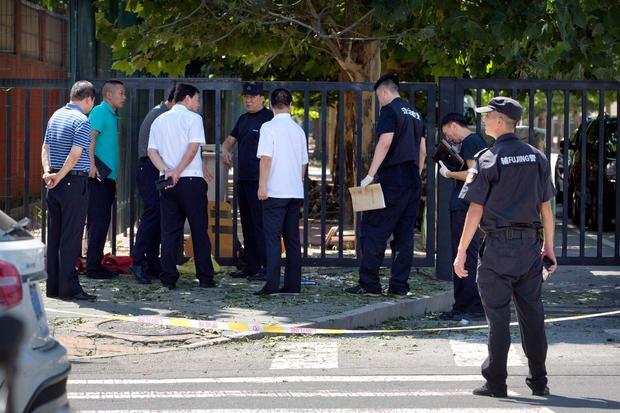 An explosion outside the US embassy in Beijing was caused by a small homemade device wielded by a 26-year-old man who only injured himself, according to Chinese police. Photos on social media showed a large amount of smoke and police vehicles surrounding the embassy after the incident. Apart from a heightened security presence, the scene outside appeared to be normal by early afternoon. A police statement said the man was from the city of Tongliao in the Chinese region of Inner Mongolia. He was injured on the hand by the explosive device, which was made from fireworks, police said. No damage was done to embassy property and no other injuries were recorded, a US embassy spokesman said. Neither the police nor the embassy had any comment on a report by the ruling Communist Party newspaper Global Times that said officers had earlier removed a woman from outside the embassy who had sprayed petrol on herself. China and the US are in the middle of a trade dispute, but America remains a hugely popular destination for travel, education and immigration for Chinese citizens.